My Ancestors and Me: Awards! What a surprise to learn that Jana of Jana's Genealogy and Family History Blog awarded My Ancestors and Me the Liebster Blog Award. I feel so honored! Thank you. Liebster is a German word that means friend, dearest, adored, beloved, chosen one. The Liebster Award is given to bloggers who have less than 200 followers. The rules vary depending on who gives the award. Since Jana did the honors, I'll follow her rules. Congratulations to my nominees for Liebster Blog Award! Way back last August (how could it be so long ago!?) Teresa Wilson Rogers of Forgotten Faces and Long Ago Places gave my little blog the Illuminating Blogger Award. I'm very grateful to her for the honor. Thank you, Teresa. I wasn't able to publicly acknowledge and pass on the award when she gave it but I find that now is a good time. Part of accepting the award is to nominate five other blogs and to mention one random thing about myself. Hmmmm. I'm a night owl and have trouble letting go of the day. I usually think I can do at least one more thing before I go to bed, then I do two or three and an hour or two has passed. Congratulations to these blogs on receiving the Illuminating Blogger Award! I always learn something when I read their posts. 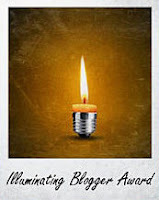 If you are nominated then you have been awarded the Illuminating Blogger Award. Just follow the steps below. The nominee should visit the award site (http://foodstoriesblog.com/illuminating-blogger-award/) and leave a comment indicating that she have been nominated and by whom. (This step is so important because it’s the only way that we can create a blogroll of award winners). The Nominee should thank the person who nominated him by posting & including a link to their blog. The Nominee should include a courtesy link back to the official award site (http://foodstoriesblog.com/illuminating-blogger-award/) in her blog post. Select other bloggers that you enjoy reading their illuminating, informative posts and nominate them for the award. It's so exciting to receive awards. Thank you! Thanks so much, Nancy, for awarding the Illuminating Blogger Award to the Graveyard Rabbit of Sandusky Bay!! Nancy - Thank you so much for awarding the Illuminating Blogger Award to Heritage Zen! What a nice way to start my day! Nancy, thank you very much for the award. It's a total surprise, I'm shocked. I'm so glad you got nominated for two! Congrats! Well deserved recognition to be sure. I enjoy your blog posts and the many photographs you share. Keep it up! Nancy - I hope I did all the rules correctly! Thanks again! Thank you for nominating me for the Liebster award. I'm honored that you think A Hundred Years Ago is worthy of it. Nancy, I nominated you for Blog of the Year Award 2012. You can learn more about it here: http://journeytothepastblog.blogspot.com/2013/01/blogging-rewards.html You deserve it, congratulations. More awards! I've nominated you for the Wonderful Team Member Readership Award. Thanks for visiting my blog! What a surprise, Debi! Thank you.